Caltech I.T. Limited (Caltech CRM) specialises in Microsoft Dynamics CRM and Microsoft Dynamics 365, and are Microsoft CRM Consultants and Microsoft Dynamics 365 consultants, UK. We are customer relationship management consultants providing CRM support and hosting expertise that enables organisations to grow, achieve higher rates of customer satisfaction and make processes more efficient. 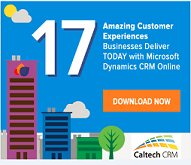 Importantly, Caltech is a Microsoft partner providing Microsoft CRM and Microsoft Dynamics 365 expertise. We have been designing and building CRM systems for small to large businesses since 1999 that are tailored to their individual needs. Whether you are new to Dynamics 365 or already using it and need some support or changes we can help. Based near Leeds in West Yorkshire we work with clients nationwide providing precise CRM systems. We are CRM specialists and gurus in Microsoft Dynamics CRM and Microsoft Dynamics 365 specifically.